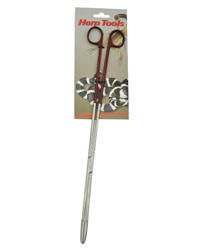 Lucky Reptile Angled Tongs Feeding Tools are high quality forceps which can be used for feeding defrosted (rodents) or live foods (insects) to reptiles and snakes. Thanks the practical handle you have a more secure grip on forceps than on tweezers. They are therefore excellent for handling dangerous animals where a safe grip is a prerequisite. Especially scorpions can be handled very well with forceps. Generally forceps can be put to the same use as tweezers. They are made of high quality stainless steel. "Love the website by the way, very easy to use"